Showing roof timbers and sack hoist. 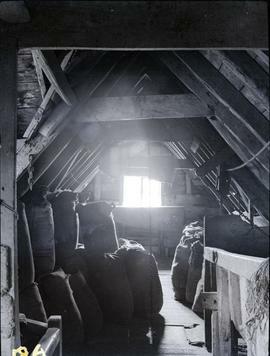 A photograph showing a view from the bin flooring of Ashley Mill near Dalham, in Cambridgeshire. Photographed by Kenneth G. Farries in August 1957. Print no. 31 labelled Ecchinswell Mill Jan 1966Showing bin floor with governor. Note sack hoist chain in foreground and control rope. 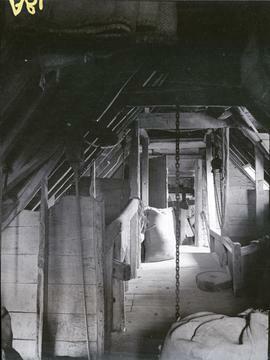 A photograph showing the plastered bin floor of Ashley Mill near Dalham, in Cambridgeshire. Photographed by Kenneth G. Farries in August 1957.